Hippies’ offspring turn out to be as anxious and confused as regular kids. 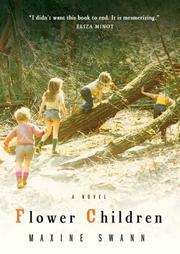 Swann opens with an idyllic portrait of four children running free in rural Pennsylvania: “They spend their whole lives in trees . . . they discover locust shells, treefrogs, a gypsy moth’s cocoon.” Their idealistic parents intend to create a new world “in which nothing is lied about . . . [or] concealed,” but soon their father has moved out, their mother has a new boyfriend and the kids are attending school, where “they’re mortified by what they know and have seen.” (Most grade-schoolers have not heard their father describe the differences between the way their mother and other women make love.) The narration shifts from rapturous third person to the voice of Maeve, who chronicles the next five years with older sister Lu and younger brothers Tuck and Clyde as they negotiate the minefields laid by their parents’ bohemian ways. Their talkative, feckless father gets most of the attention; in the best and funniest chapter, “Intervention,” we learn that Dad’s parents and siblings are as odd as he is. Their mother’s mother, by contrast, is conventional and censorious; at her house, the children are embarrassed by their mother’s earnestness and unconventional clothes. “Secret” examines Lu’s and Maeve’s relationships with other kids at school, including two brothers, big-city transplants rumored to have moved to Pennsylvania due to trouble back home. Though Maeve kisses the older boy a few times, class trumps ideals; she and Lu are sent to a better school to prepare for college, while the Kalowski brothers fall into petty crime. It’s hard to discern what readers are meant to take away from this parade of disjointed chapters that reads more like a story collection than a novel. Swann’s prose is as lovely as ever, but her insights here are less penetrating, her portrait of a hippie childhood vaguer than the razor-sharp specificity with which she delineated adolescence in Serious Girls (2003). More of a mood piece than a novel.